The first time I was conscious of someone performing this song was Rick doing a marvelous job that still will pop up as a brain worm for me from time to time. He recently pulled it out at my request on a recent Monday performance and I was asked for the lyrics during the following break. 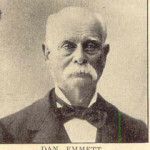 The famed Daniel Decatur Emmett composed this song in 1843 for a minstrel show and it quickly became quite popular. 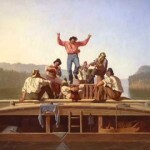 It is written in the fashion to mimic the speech of the regular, less educated men of the time (as it were) and reflects the wild and fun-loving boatmen on the Ohio River. There are many versions circulating in the folk music world today but the following is the original set of lyrics. De boatman dance, de boatman sing, de boatman up to eb’rything. And when de boatman get on shore, he spends his cash and works for more. Dance, de boatman dance! O dance, de boatman dance. And go home wid de gals in de morning. De fishin’ smack should venture more. An’ dey cram me in de calaboose. Wid a hoosier mate an’ a captain too. Look out, my boys, for de nine tail cat. Den put ’em in bag and tote ’em to boat.